How to make money with Instagram accounts. Are you looking for tips on how to make money with your Instagram account? You’re not the only one. Instagram is becoming one of the biggest social platforms on earth, and it holds the second place right under Facebook. In fact, in 2018, Instagram outranked the popular Facebook Messenger in terms of overall users. In all fairness, in a couple of years, it may dethrone Facebook as the new social media king. So, it’s pretty clear that investing in this platform is a smart thing to do, especially if you want to monetize your Instagram account. We’re sure you have seen the countless news reports on celebrities making enormous paychecks for merely sharing a photo on their Instagram profile. Currently, one of the top earners, Ms. Selena Gomez, earns up to 500,000 USD per sponsored post! It helps that she is a world-known celebrity and has over 100m followers, but can you realistically expect the same? Unless you’re a celebrity or a famous influencer, you most likely won’t be receiving large payments, but that doesn’t mean that you can’t earn a decent paycheck by following our Instagram money-making guideline. 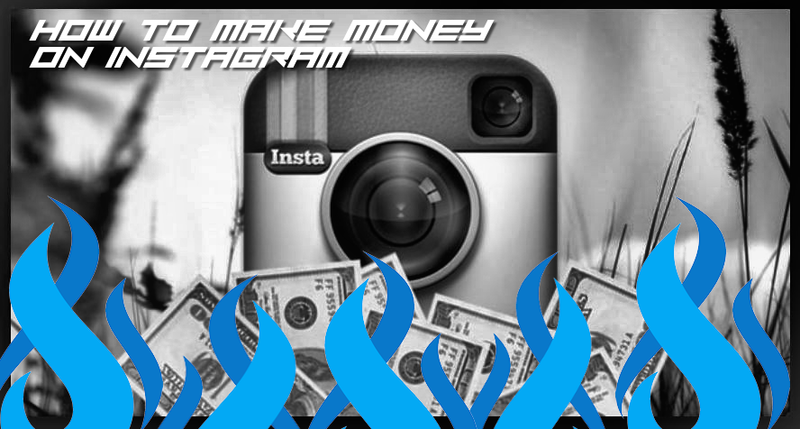 We’re set to show you the realistic side of Instagram money making, including average wages, for regular joes with smaller, less-known Instagram accounts. Before you begin to make money with an Instagram account, you will need followers. We’re sorry to say, but if your Instagram account has 5, 7, 10, or even 40K followers, you won’t make much money, unless your Instagram caters to a very desirable niche. Memes, humor, art, and generic photos aren’t considered profitable. You need real-world topics that could help businesses convert those followers into potential leads/clients. Computer hardware, fitness, health, general consumer electronics, those are examples of desirable niches. Don’t get us wrong, you can still make money with humor accounts, but their abundance causes their value to drop. If you don’t have followers, you have a tough road ahead of you, as building accounts isn’t easy. But if you’re willing to try, please use these following tips to get you started. Make sure you bio space is filled out correctly: Share your contact information, what you post about and where you’re from. It also helps if you add a few keywords and hashtags to ensure you’re easily findable by the right kind of followers (it helps by listing you higher in SERPs). It is also recommended to post your business email address so people can contact you easily. Post regularly: Inactive accounts stay inactive, so don’t expect to grow if you post 1-2 times a week. To stay on top, it is recommended that you post once or twice a day. However, don’t over do it. Posting too frequently spams your followers, thus creating a reverse effect and causing a drop in fans. Good content is a much: If you’re going to copy photos from other Instagram accounts, don’t expect to grow. If you are going to copy pictures from Google Images, don’t expect to grow. Instagram is about being unique, and only unique content truly causes accounts to explode in followers. This is easier said than done, as we aren’t all professional photographers. If you’re going to copy images, make sure to add your own twist to them via photoshop edits, for example. Use correct hashtags to describe your images: It’s highly unlikely your pictures are going to reach the masses without relevant hashtags. They’re descriptions for Instagram’s internal search engine, so without hashtags, your work will never get discovered. Engage your followers: Respond to comments, like their content, thank them for being your followers, and do whatever it takes for them to stay active. Just by talking to your followers in the comment section will show them that you’re dedicated to your cause, which will cause a stronger bond. Remember, followers can leave too if they aren’t happy, so make sure to nurture the people who gave you that follow. So, you want to start making money with your account but don’t have the time or skills to grow one? Don’t worry; there are shortcuts. You can purchase established Instagram accounts on sites like BuySellAccounts.com or SWAPD. Buying a good account takes time and money, but if you have a little cash to invest, it’s probably the best route to choose. It will save you months/weeks of hard work. Now let’s move onto Instagram account monetization! Selling shoutouts is the most common form of earning from Instagram accounts. In Instagram terms, shoutouts are a form of advertising other accounts. Hashtags are sometimes used to accomplish this, but mostly it’s about tags. Mainly, you are drawing attention to other people’s Instagram accounts and asking your followers to follow them. This method is used to grow accounts, it works very well, and it’s the most common way of gaining new followers. You can find willing clients almost everywhere, from popular marketing forums to influencer platforms. Heck, even talking to random people on Instagram will get you business. Gaining new clients is easy, but making good money from shoutouts is not. The average prices for one shout on a 50,000 follower Instagram account will net you 5-25 dollars (for a 24-hour post). For larger accounts (200-300K followers), you’re looking at 50-150 USD per post. Accounts ranging from 500K-1m+, a shout may earn 200-500 USD. Most shouts only last 24 hours, after that it’s a common method to delete the post, so the feed isn’t over-spammed. To get these prices, your account has to be in good shape. That means premium followers from countries such as US/CA/UK/AU and desirable activity levels. You can check where your followers are from and the current activity by converting your Instagram account into a business account. Most of us have been using the power of persuasion from birth, but very few people study techniques on influencing others. The power of influence and persuasion is an art, especially when done by sharing a simple photo. People are driven by instinct, emotions, needs, desires, and beliefs. Companies use these human traits to influence them into buying their products or services. Influence campaigns are very subtle, and they don’t necessarily mean an aggressive product push. It’s usually a subtle way of advertising. For example, if you own an Instagram related to fitness, you could have a protein shake in the background in one of your photos. You don’t have to mention it, endorse it, or even point to it. Just the fact that it’s in the background is enough to influence someone into trying it one day. “Hey! I’ve seen it on Instagram, let me try it.” Influencing people is a powerful advertising tactic, and companies are willing to spend big bucks to access this influence. You can make as little as 250 USD per post, up to tens of thousands of dollars. With influence, the size of your account isn’t as important as activity, follower engagement, and the niche. It also helps if you’re somewhat famous, even “e-fame” is good enough (such as YouTubers, Vine celebrities, etc.). There are regular joes who became e-famous, and they earn up to 15,000 USD per post on popular Influence platforms such as Socialix. Generally speaking, if you need to look for influence deals, you will most likely won’t find any, or it will be challenging to do so. If you own a good Instagram account, influence deals will find you. That’s right, businesses scour the web continuously for new places to advertise, and if your account is a leader in your field, they will approach you. But, that shouldn’t stop you from trying. Try one of the countless Instagram influence platforms and give it a shot. Do what now? OK, we admit. This method involves selling your Instagram account, as in entirely. This is undoubtedly the least recommended method, as it will only net you a one-time payday. However, if you don’t have time to deal with shoutouts, or you aren’t influential enough for advertisers, selling your Instagram account may be the only logical way to go, especially if you need some quick cash. Actually, you can even go further and try the world of buying/selling social media accounts (yes, it’s a thing). There are tens of thousands of people doing this every single day, and some of them make a good living out of it. The concept is simple, buy low and sell high. That’s it! Finding willing sellers takes time, but with the vast userbase Instagram offers, all it takes is a few nights of chatting to people via DM’s, and asking them if they’re willing to sell their account. Buying an account is the hard part, selling is easy. With the countless marketplaces (just Google them), you will find selling an account a breeze. Instagram accounts sell anywhere from 150 USD to hundreds of thousands of dollars. Yes, that’s six-digits. We have personally seen Instagram accounts sell as high as 300,000 USD. For now, we will close this guide on these three methods, as in reality, Instagram is a very limited platform and doesn’t offer other monetization methods. Are there other ways of earning on Instagram? Sure. You could, for example, sell your photos. However, that requires the knowledge and skill of a good photographer. You could push affiliate products, but that will only anger your fans (spam). You could sell photos of you with sponsored products, but that would require that you’re a celebrity. Selling shoutouts, influence, and accounts, are the only current viable methods of money making on Instagram. Which method would we use? Buying and selling accounts is more lucrative than shoutouts, for example. If we had to rank these three Instagram money making methods, we would say that influence deals make the most, while buying/selling takes second place, and respectively, shoutouts take third place. If you have any questions or comments, ask away in the comment section below.